We are making Tales of Hearts R’s November 11th launch on PlayStation Vita something to remember! The latest western JRPG release in the long standing ‘Tales of’ series will be compatible with PlayStation TV! Many of you asked for such a feature and we are more than happy to make the PlayStation TV’s launch even more awesome. That’s not all however! In the tradition of previous ‘Tales of’ releases, we are happy to reveal more info on our pre-order promotion and Digital Limited Edition in the Americas! 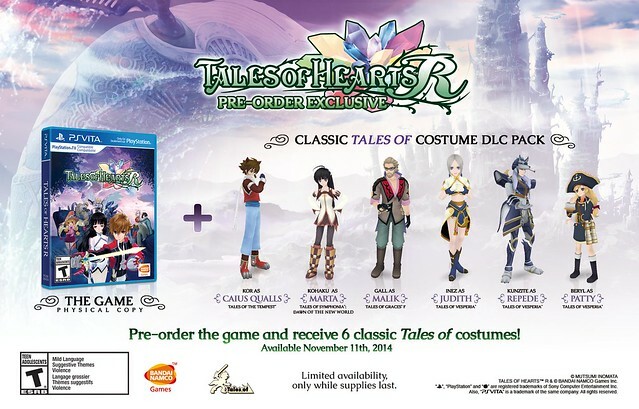 Pre-order Tales of Hearts R in the Americas from participating stores and get a classic ‘Tales of’ costume set with outfits paying tribute to a range of previous ‘Tales of’ games on launch day! This exciting content will be included as a digital bonus while supplies last. If you’d rather get the game digitally, you can buy the Digital Limited Edition on the PSN and get the same six awesome costumes! But don’t procrastinate, because the Digital Limited Edition will only be available until the end of November. Save the date: Tales of Hearts R is coming to PlayStation Vita and PlayStation TV on November 11th! now this is the AAA RPG I’ve been waiting for. hopefully this is just one of many in the future. Do I get the dlc even if I already pre ordered? Also, bring digimon cyber sleuth to NA, I’m not even a digimon fan but that game looks so good. Do you have some sort of chart for that? I mean if you are saying they are in the minority you must have some proof right. I am not trying to lose another game worth playing, due to lack of localization. I look forward to this game either way. Games quite are not the same anyway, since reading can be done easier. But acting like your the majority, is not what I would call accurate. Some would really like dubbed, so why do you feel the need to comment like they are (whatever), because they do. Let people voice their opinions already, without the need to criticise. Just used to getting double teamed, and should have looked better. this game has been on gamestops site for months and you waited till now to dignify the preorder with its dlc bonus? *oh youd think you might wanna include that your OWN bandainamco website also has this game up for pre-order too. one piece: pirate warrior 2 & 3.
gundam breaker 1 & 2. Not buying unless there is English dubs.. I don’t like reading subtitles as it distracts from the game. At least if you are going to do subs, and no dubs please put an option to turn off the voices, so the game can be played like from the Ps1 era. Was really disapointed that: Deception 4, Sword Art Online, this game, Freedom Wars, and Warriors Orochi have no English dubs. I was going to buy all of them, but changed my mind because of it. IF NISA and Xseed can relase their games in English, why can’t Tecmo Koei and Bandi? Wish Sony never loosed the rules. The only game where the Japanese dub makes sense and I can deal with it is Yakuza, because well it’s in Japan, and with real looking Japanese characters. I don’t think of rpg characters as japanese as they look nothing like it. At least this game will get a physical copy despite it having Japanese voices. I don’t care about Japanese voices, I rather having a physical copy than lose it because of no English dubs. Hope this trend continues. I was actually wondering about the Japanese version of this game. Some of us already own that version of this game, as well as Infinite Evolve. Will they be getting PS Vita TV support again too? Infinite Evolve doesn’t even use any touch screen functions to begin with, and it ended up getting locked out for Vita TV support. I tried asking this on Bandai Namco’s Japanese support page and got a pretty vague response emailed back to me. This is why I’m asking here. @ MX-Arekku supposedly yes they come with the bamco version too according to a gfaqs user. @MossadAgent if you already preordered it I would imagine it would get updated to include the dlc. You can order it through bamco’s store which they have amazon fufill now instead of digital river. They just started taking preorders a little bit ago last week I think. Thank you for making this game compatible with PS TV! I already pre-ordered my copy at Gamestop! I’ve got 77 hours currently sunk into Xillia 2. Another Tales game just around the corner? I’ve had this pre-ordered ever since it was available to do so. Only found out recently that it was releasing on November 11th. That day is just packed with releases. Now that The Crew has been delayed again, I’m ONLY picking up four games… not enough time in the day to play them all. Gonna have to figure something out. Thanks for finally bringing this over here! I preordered the game the moment I was given a Gamestop gift cards…. November can’t come soon enough! You folks are the minority. If you wish to delude yourself into thinking otherwise, then let give me a few minutes while I laugh at you. JRPGs are a niche product that sells primarily to fans of anime, who often enjoy the original Japanese audio. Thus do not need English dubs to enjoy. It’s not a matter of being lazy. It’s a matter of cost adjustment. It’s either no dub, or no localization at all. Dubs simply add an (often) unnecessary cost. The people who won’t buy a game without a dub are a very small minority. And no, importing if we want Japanese audio is a foolish suggestion as we want the English translation you imbecile. Shoo. Also waiting for Zestiria next year! @73 Laugh all you want, it does not make you right. Vita owners are actually the minority, not those that want English dubs. They know there are almost no games for it, and that people might be willing to pay for anything. Much like Sword Art Online being a digital title only. But had there of been more Vita owners, I could guarantee that the MAJORITY would want English. Wether they buy it or not because they want a game, makes the question irrelevant. Bahamut is basically speaking for those of us with brains to see more than self gratification at its earliest convenience. The company is using limited Vita titles as a way to bring us something not completely done, and yet wanting to charge full price. You may not care, but some of us do not want every game there after to not include English dialogue. Some games have been made much better due to good voice acting. Will I buy anyway, possibly, but it will not be untill there is a decent sale to compensate, since I actually buy digital and not rent or trade in. Maybe I should just start renting, so I will not care either. Anyone have a good suggestion for Vita games? hey @Grace Liu, can you confirm if the bonuses come with pre-ordering on the namco store via amazon? It’s freaking some people out on gamefaqs so I’d like to clarify for them! I hope it’s English dubbed. One too many games l ended up skipping (lately) because of no English audio option. This will be a definite buy when I get the money for a Vita. is there any chance of the new Vit having a new package this Christmas, or for sale on its own? Im just not a fan of the Borderlands series. I would love to see a rpg vita bundle come out for sale. Dear Namco Bandai: Why aren’t your bringing Pac Man to VIta? Pac Man CE would be awesome. Also Pac Man and the Ghostly Adventures came to PS3 and also 3DS, but not Vita. Looks Ghostly Adventures 2 is also not coming to Vita. We want to play Pac Man games on the Vita. Please consider it. I’m buying this for sure! It’s not. The choice was no dub, or no game. Clearly the only reasonable answer here is no dub. @82 Well fair enough. I guess I’m not going to buy it now. Even If I do get the game later it won’t happen until it gets a price drop. Also, I hope like most other jrpgs you can mute/lower the voice audio track. I’m going to end up playing it with only SE and BGM on if anything. I look forward to this. Just beat Xillia 2 the other day. Love the retail versions of great games you guys have been giving us, thanks! I went through my physical copies of games (which I absolutely prefer) and found that many were from Bandai Namco. As a result, I will be expressing my appreciation by pre-ordering this title. I’m gonna have to go with the so called “minority” on this one and say that I’d probably buy this in a heartbeat if it had English dub. I hate watching foreign movies with subtitles and games are no different. It’s really jarring. In the Japanese Release of ‘Tales of Hearts R’ it included a small downloadable arcade side scrolling beat em up game. Will this be the case in america as well? why is it not on Amazon.. I can’t order it and I’m living outside the US ! Will the “standard” digital version be available after the LE is taken down at the end of November? does anyone know if this is going to be day 1 digital on PSN? and what is the psn cost going to be? 40$ or 50$? Just put down a pre-order at my local GameStop for this one. Will be my first Tales game and looking forward to it!